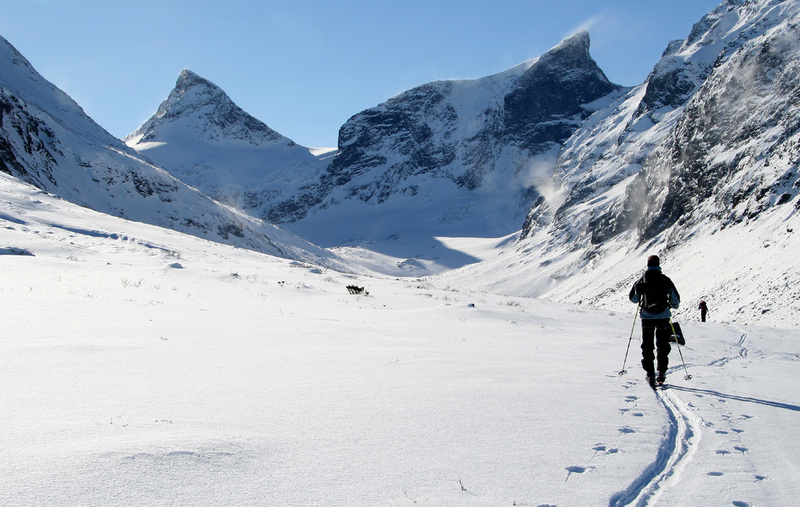 How to get there: A good starting point is the mountain hotel Turtagrø. This hotel is located about 15 kilometer up from Skjolden, a small village at the end of Lustrafjorden (the innermost arm of the Sognefjord). From Bergen, drive E-16 to Lærdal, take E-5 across to Sogndal (ferry from Fodnes to Mannheller), then Hwy. 55 to Skjolden. In the summer, one can drive Hwy. 53 to Øvre Årdal (instead of taking the ferry), then follow a private road across the mountains directly to Turtagrø. From the east, drive Hwy. 55 across Sognefjellet (closed in winter). There is parking on the right hand side of the road, the elevation is approximately 880 meter and the location (parking lot) is N61:30.217, E007:48.193. Route description: Follow the (private) road that connects from Turtagrø to Øvre Årdal about 2 kilometer. This road is closed in winter. Gradually, the slope on your left side becomes more gentle, then you will see Ringsbotn forward on your left side, the road crosses the river Ringselvi a bit further ahead before it climbs the slope on the other side. Well before the river, climb the gentle slope above you, about 100 vertical meter, in order to enter the small, but distinct Ringsbotn valley. Store Ringstind stands proudly 1000 vertical meter above you at the end of the short valley. Approximately one kilometer into the valley, one should start to gain elevation while traversing forward on the left hand side hillside. In summer, this trail is marked with cairns. The approach is fairly obvious, the highest route will reach a somewhat distinct, level area before it enters the steepest part. 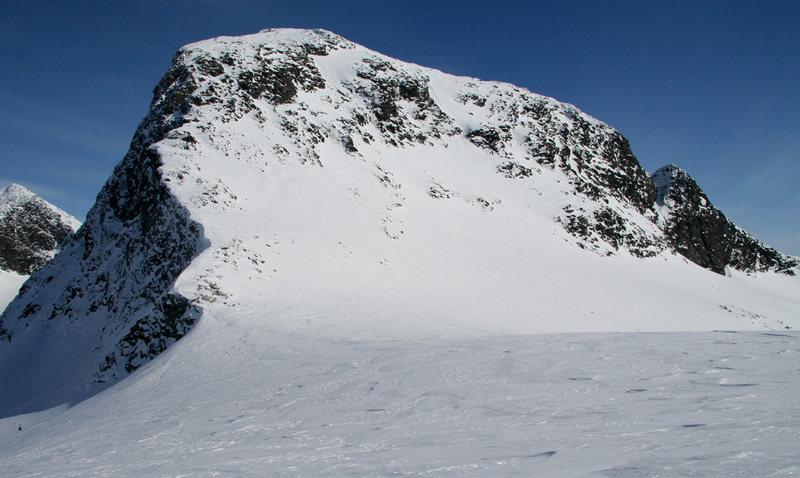 In winter, with icy conditions the steepest part of this traverse has some exposure and crampons and an ice axe should be carried (and very likely used). 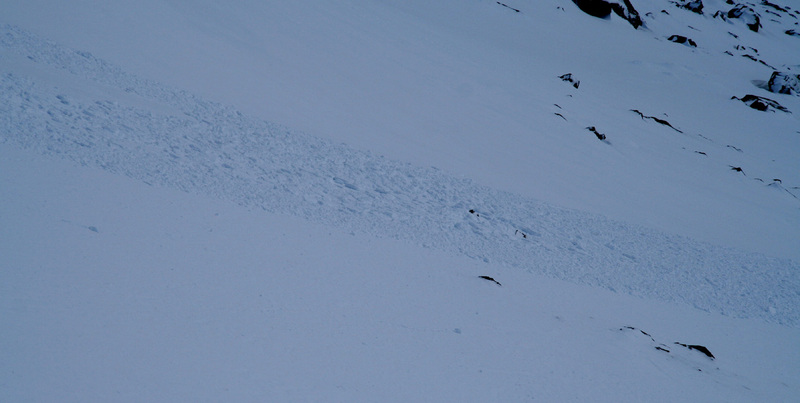 With more snow, this section of the route has definite avalanche hazard and good judgement must be used before making an attempt. 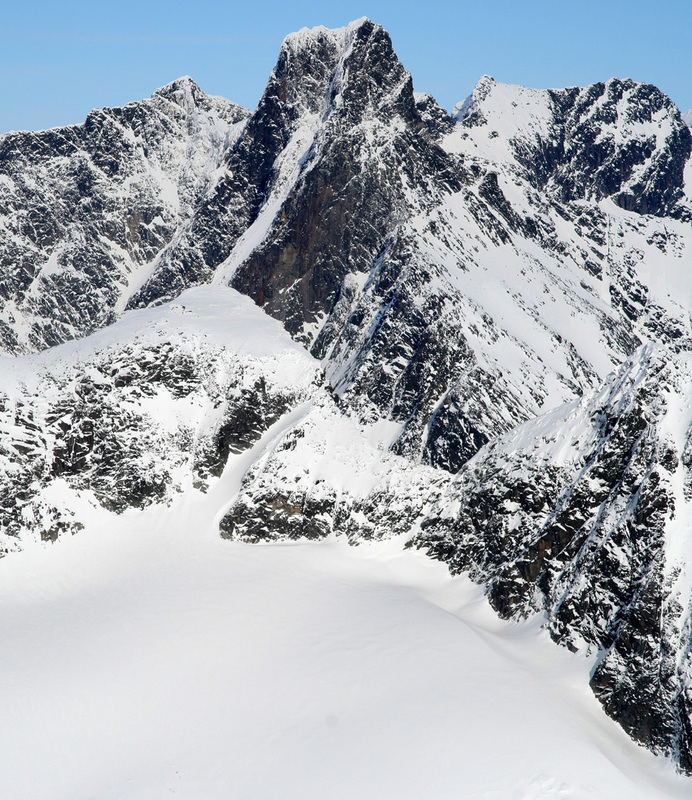 In winter, this upper part of the traverse is likely the crux of the route, measured in steepness and with regards to objective hazards. 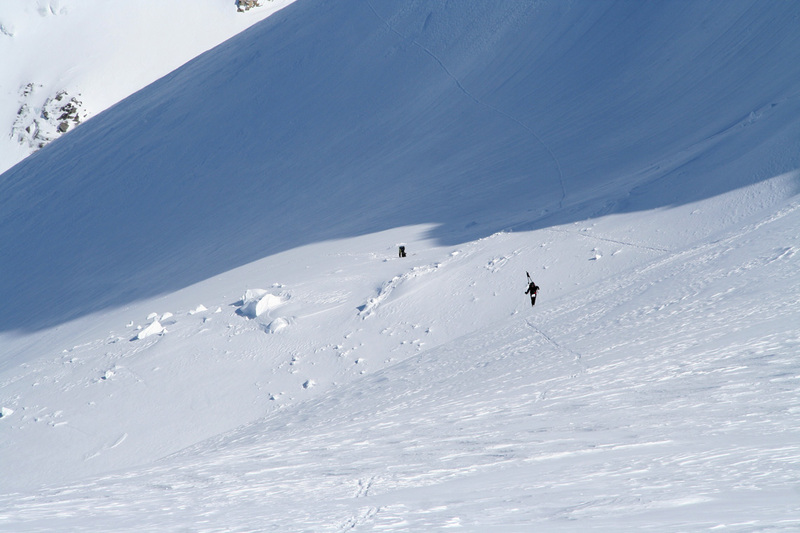 After reaching more gentle terrain, descend slightly in order to gain the edge of the glacier. The alpine landscape in front of you is impressive. 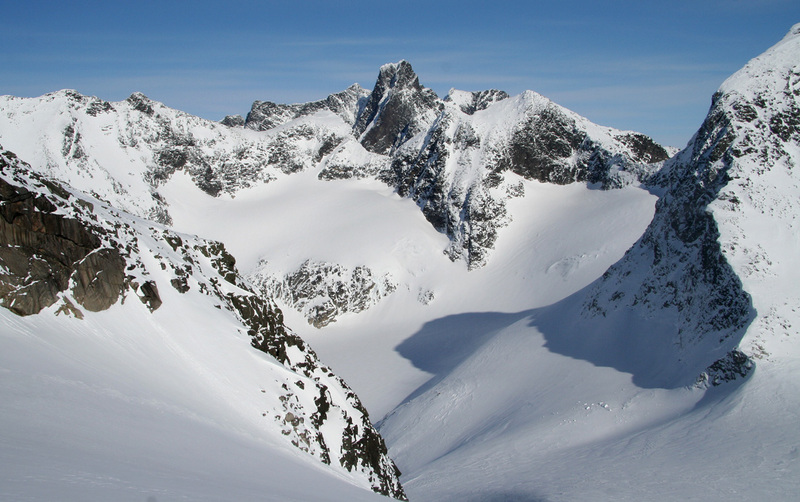 Midtre Ringstinden is straight across the glacier, Store Ringstinden to the right and more peaks also further left. 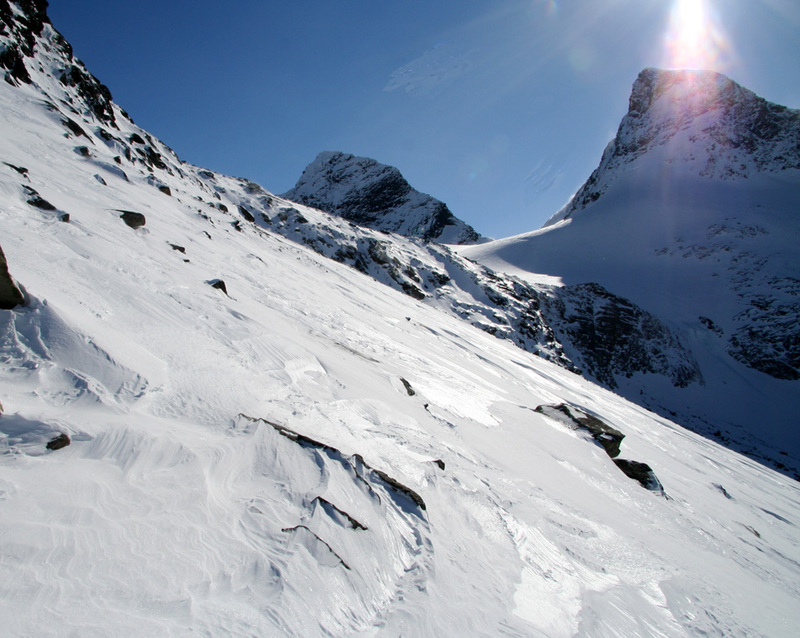 From here there are variations, however the most comfortable route on skis is to head up the glacier aiming slightly left of Midtre Ringstinden. 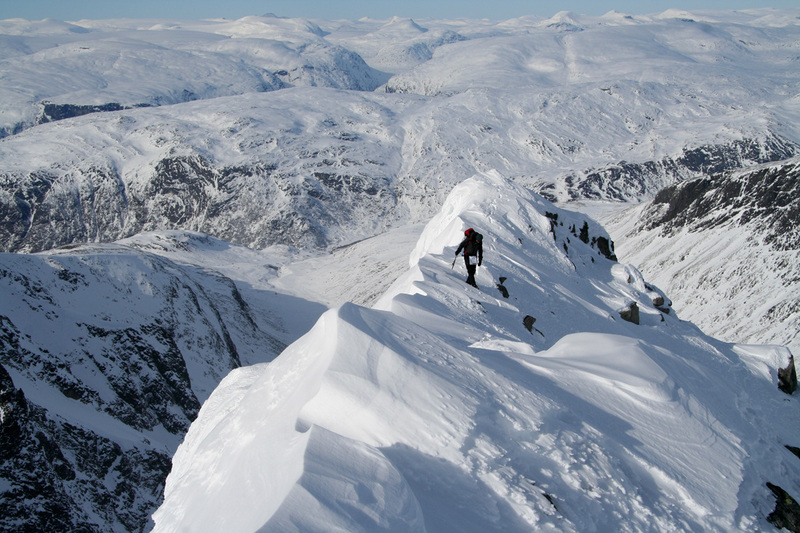 Higher up, change your course right and traverse below and in front of Midtre Ringstinden. This route has the most gentle slope. Alternatively, one may traverse more directly towards the saddle between Midtre Ringstind and Store Ringstind, this route will cross a slightly steeper slope. The saddle between the two peaks has elevation 1743 meter, location N61:26.528, E007:48.920. A very nice view of Store Stølsmarratind opens up from this saddle. The slope towards Store Ringstind is not steep and very nice for skiing. Pick your course upwards, typically a few natural zigzags tending to the left side as you face uphill. Just before the final slope, you will reach a small ridge and the impressive Store Austabotntind is suddenly right in your face. Turn more right and gain the almost flat area below the summit slope. This is a good place to leave the skis unless the conditions are perfect for steep snow skiing. The final stretch is best done by going pretty far right, gain the summit ridge here at its lowest point, then follow the distinct ridge up to the summit. Comments: I made this climb with Helge Larsen and Olav Glosli. Later this spring, we will make an attempt at Denali, this weekend offered a chance to do a winter camp together. We left Bergen around 1630, stopped for dinner at Sogndal and put up our tent for camp around 2300. 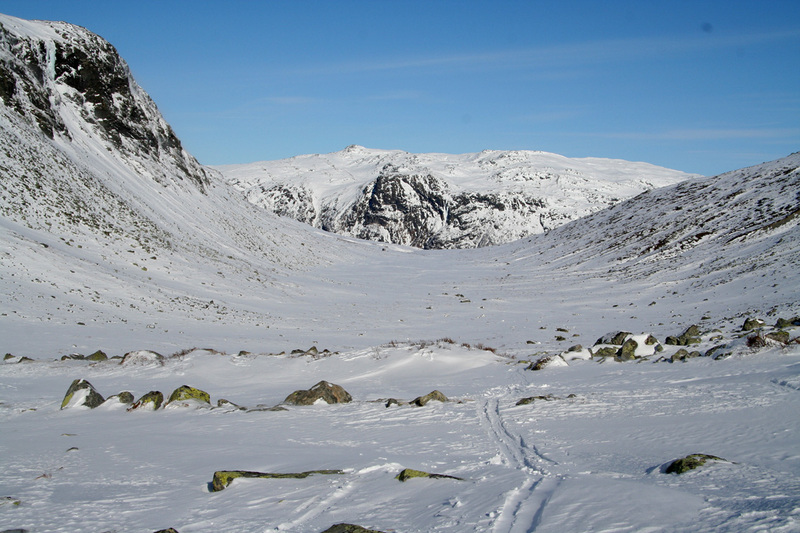 The crux of our route was clearly the traversing ascent from Ringsbotn to the glacier higher up. We picked a route slightly higher (more to the left) than the summer route and Helge showed his climbing instinct as he suddenly moved up across rocks in a pretty exposed area. That left me a bit bewildered, with ski poles in one hand and my ice axe in the other, there was no obvious way to follow without rearranging equipment. Olav followed behind me and as I asked him to hold my ski poles, he decided to crampon a short traverse below the rocks instead of following Helge. This was obviously a technically easier route and where I should have moved in the first place. We descended gently to the edge of the glacier and had a short break there before continuing towards the saddle that separates Midtre Ringsrind from Store Ringstind. Helge had a skin breakdown pretty early on the trip and therefore climbed the peak on foot all the way from the Ringsbotn valley. 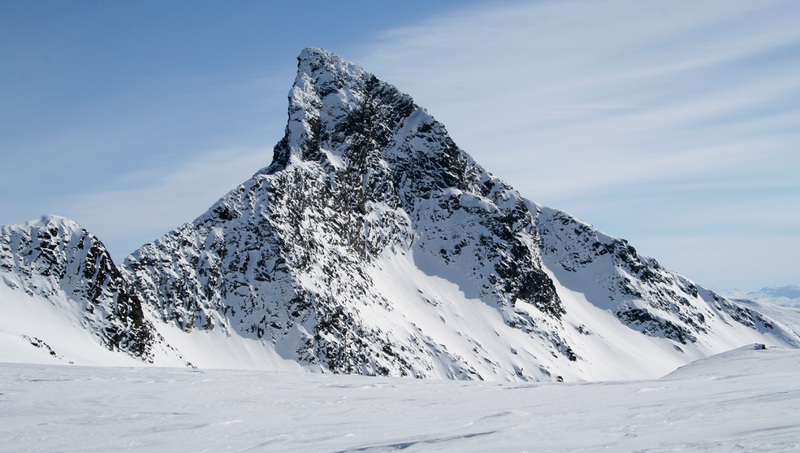 The ski ascent was very nice indeed and soon we stood on the summit of this impressive peak. The view across to Store Austabotntind is truly impressive. Storen stands as a king with smaller peaks around him, in the opposite direction. After about 15 minutes we started the descent. 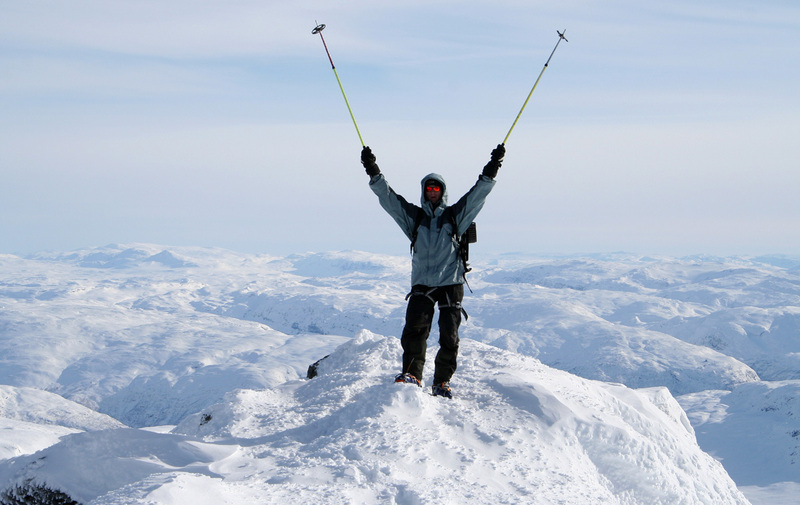 Helge did not regret the effort to carry his skis all the way on foot. The skiing back down to the end of the glacier was just very nice. We took a fairly steep, but less exposed route back down to Ringsbotn, the advantage being that Olav and Helge could do some steep skiing. My skis are not designed for hills as steep as this, but a descent with crampons and ice axe was quite straightforward. Olav skied first and released a pretty big, but shallow avalanche, luckily he turned out of the avalanche just as it started, avoiding a somewhat bumpy ride with it to the valley floor. 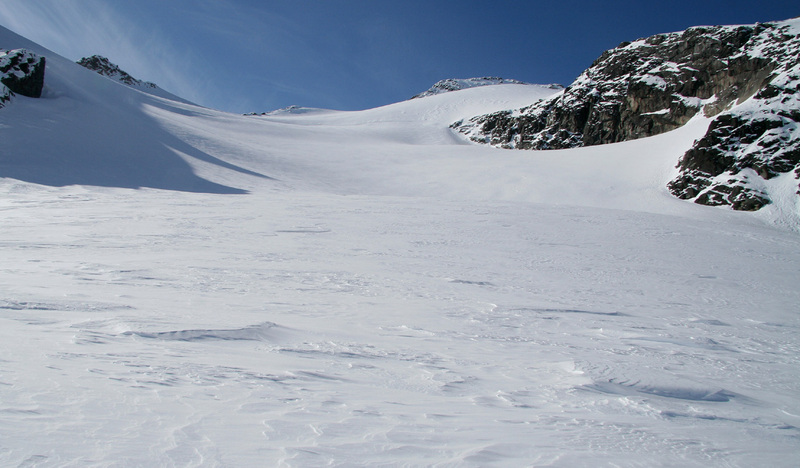 The snow layer that broke and avalanched was so thin that there was no real possibility of getting buried. We started from Turtagrø at 0845, made the summit at 1500 and returned to our tent at 1815. The sun was about to set and REAL Turmat tasted well before a second night in the mountains. 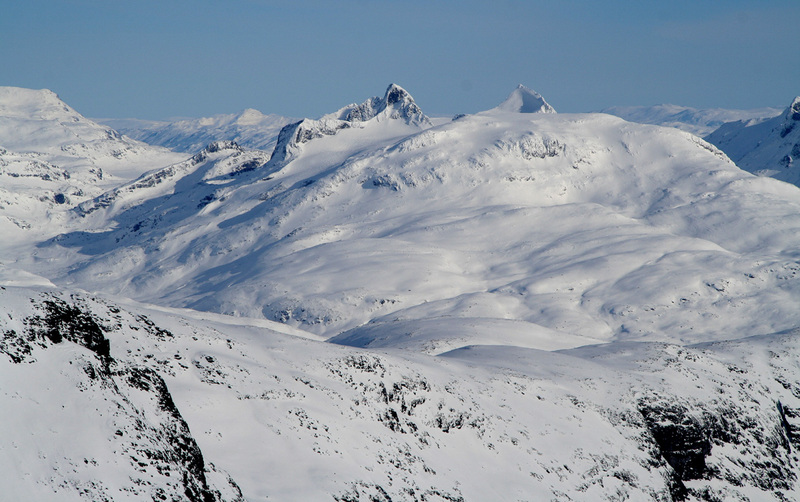 Skiing in Ringsbotn, alpine landscape. 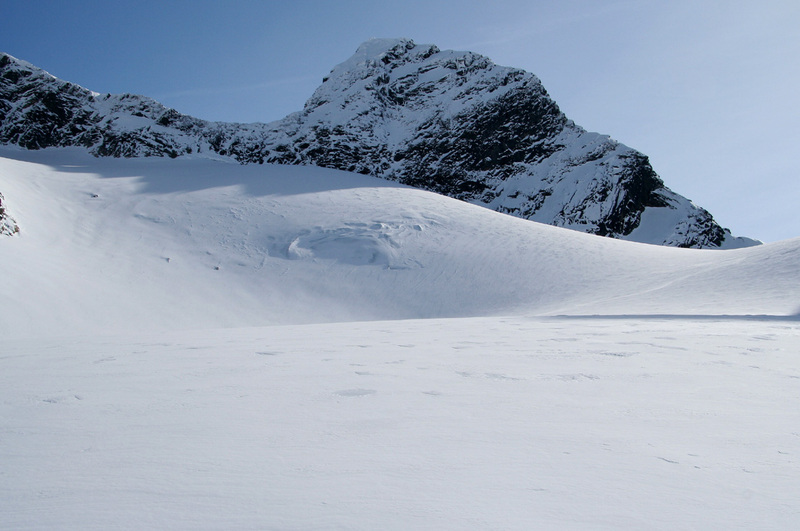 Store Ringstind, note the snowdrift that shoots off the summit. The crux area ahead. One needs to gain the plateau further up and ahead. 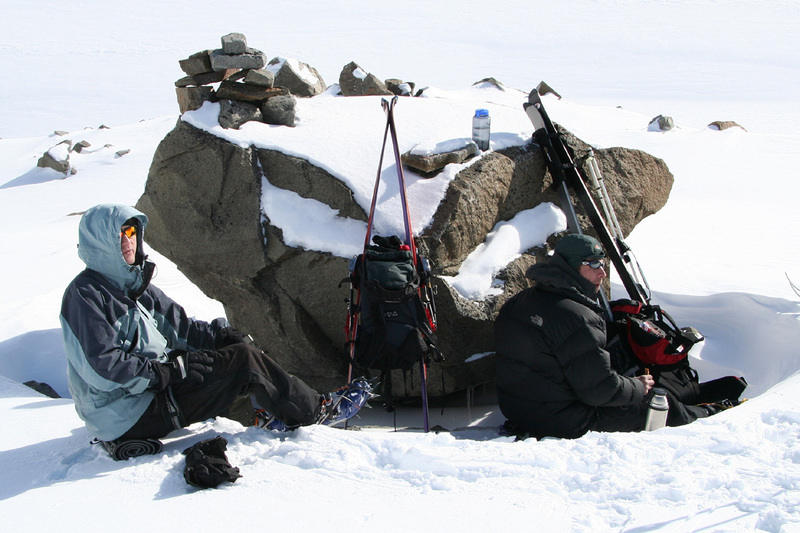 A rest near the glacier edge. Store Ringstind as seen from the glacier edge. One needs to traverse across to the saddle, fortunately, this is a bit easier than it looks. Østre Ringstind as seen from the glacier edge. Stølsmaradalstinden as seen from the saddle between Midtre and Store Ringstind. Midtre Ringstind as seen from the connecting saddle. Olav and Helge approaching the saddle between Midtre and Store Ringstind. My ski route can be seen traversing higher up. 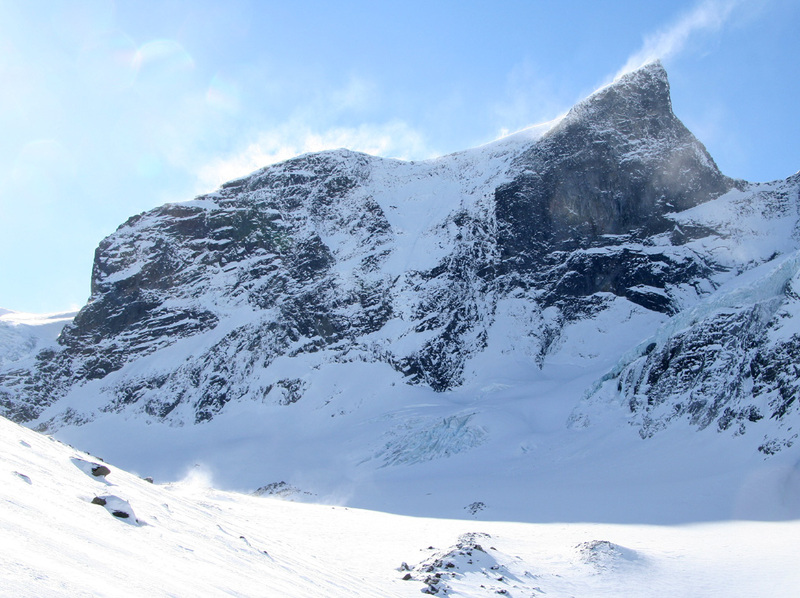 The glacier, running up towards the summit. It is somewhat steeper than how it looks here. Storen, seen while climbing Store Ringstind. The route comes up the valley below. Midtre Ringstind to the right. The summit ridge, Helge is approaching the summit. Storen, as seen from Store Ringstind. Store Austabotntind, as seen from Store Ringstind. Stølsnostind and Falketind, as seen from Store Ringstind. 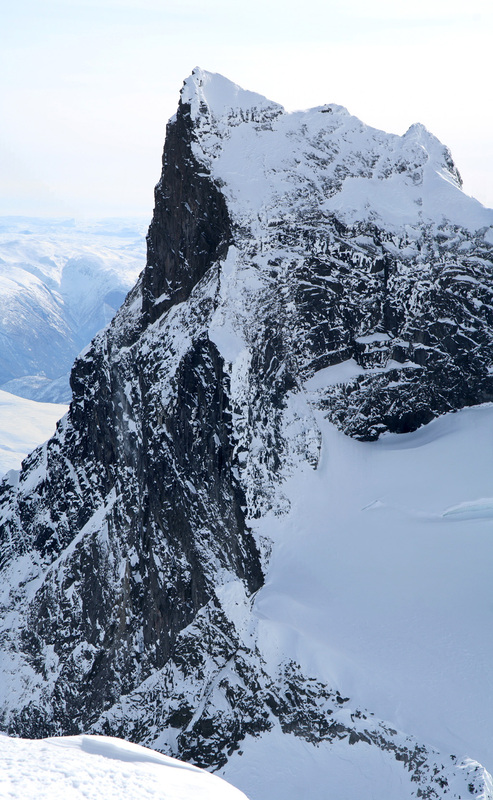 The avalanche, this is a small section of what Olav triggered. As can be seen, it is pretty shallow. Summit panorama north to east. Storen (2405m) and much more. Summit panorama south. Olav takes a picture of Store Austabotntind.